This new release features the first-ever commercial recording of three newly discovered, substantial viola concertos by German-born Swedish composer Joseph Martin Kraus (1756-1792). Kraus, one of the most innovative composers of his time, was equated by Haydn to W.A. Mozart as the only two geniuses he knew. The featured works are the only known music from the Classical Era to demand the utmost virtuosity from the viola soloist. 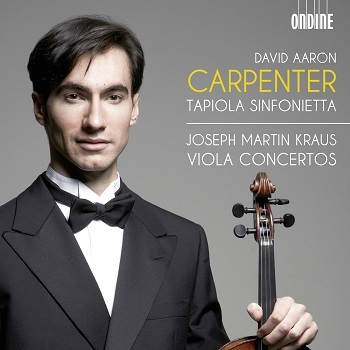 David Aaron Carpenter has emerged as one of the world's most promising young artists and is Recipient of the 2011 Leonard Bernstein Award and of the 2010 Avery Fisher Career Grant. In the words of David P. Stearns of The Philadelphia Inquire, "If there's such a thing as an overnight-star violist, it's David Aaron Carpenter. (...) Carpenter is in a league with the best." This release follows on the great success of David's earlier recordings, including the Elgar and Schnittke concertos with the Philharmonia Orchestra and conductor Christoph Eschenbach, which was given an ‘Editor's Choice' accolade by Gramophone. One of the leading chamber orchestras internationally, the Tapiola Sinfonietta has made acclaimed recordings of Classical repertoire, including the Complete Beethoven Piano Concertos with piano soloist Olli Mustonen.